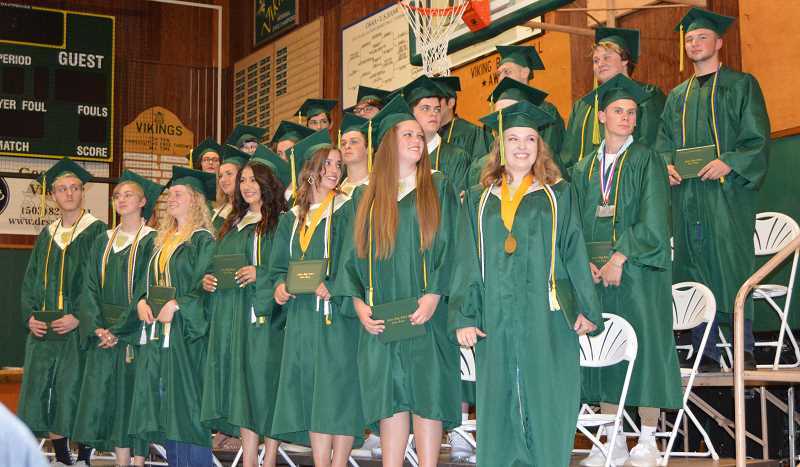 Colton's graduation rate as a whole, as well as the rate among historically underserved subgroups of students, have climbed right alongside Oregon's rates, according to the latest graduation data released by the Oregon Department of Education. Colton's graduation rate for all students is up to 86.5 percent for the 2017-18 academic year, compared to 85.5 percent the previous year. This sits comfortably above the state's graduation rate of 78.7 percent, which is up to the highest ever. This is the second consecutive year that Colton's graduation rate has climbed, but what is noteworthy about Colton's data is the rates among groups such as underserved races and ethnicities, students with disabilities and the economically disadvantaged. As a state, Oregon's graduation rate has improved in these areas as well. "Our diverse learners, our kids with disabilities, our students with socioeconomic barriers, have just been growing tremendously," said Colton Superintendent Koreen Barreras-Brown. "And that's the work that our team is doing with families and students. So you can see where we put our focus…and it's exciting." Colton's graduation rate for underserved races and ethnicities is 100 percent, the same as in previous years. Oregon's rate rose to 73.5 percent in this category. Students with disabilities saw a steep increase in on-time graduation to 81.8 percent from 57.1 percent the previous year. This is nearly 20 points higher than the state's rate at 60.6 percent. The rate for students with economic disadvantages rose to an astonishing 90.9 percent from 72 percent the previous year. In Oregon, that rate now sits at 72.4 percent. How does Colton get so many more historically underserved students to walk across that graduation stage than other districts? According to Barreras-Brown, among many efforts, it involves: 1. getting all staff on the same page, 2. supporting struggling students of all abilities, 3. looking at individual student data and using it, and 4. budgeting for all of this. Recently, the entire Colton School District adopted educational leader Jimmy Casas's four core beliefs, which are: champion for kids, expect excellence, carry the banner and be a merchant of hope. The district held at least one professional development event focused on these core beliefs and what they mean. "We gave each other permission to challenge each other," Barreras-Brown said, "like when someone's not following those, to be able to say, 'Hey, are you championing the kids right now? Are we carrying the banner?' "
The other way that the Colton staff works as a cohesive unit is through instructional agreements that all teachers, in kindergarten through 12th grade, use in the classroom. Colton uses a full-inclusion model, meaning all students, regardless of their ability-level, are in the mainstream classroom as much as possible. Of course, that doesn't mean expecting classroom teachers to do all the work. According to Brown, the district trains educational assistants and other staff on working effectively with students who have special needs. "You can't just plop kids with special needs in a classroom filled with a bunch of students without the support for that teacher and the students to be successful…That's not fair," Barreras-Brown said. Colton also keeps tabs on students with special needs who are outside-placed to ensure those Colton students are on track to graduate. "It's not about the graduation rate, it's about the kid," Barreras-Brown said. "These are our kids no matter where they're at. They're our students." Since Barreras-Brown arrived at Colton School District, this has been her anthem: using data to inform teaching, learning and leading. "That's really the only agenda that I have—is that we become data ninjas, that we're using that data to be better at our practice, at our craft," Barreras-Brown said. "It's exciting because it's actually paying off." In addition to using graduation data, district report cards and state assessment results, Colton also uses MAP data. This is a tool that allows Colton staff to look at individual student progress as well as whole classes. This tool has been in place in Colton for years, but recently, staff members have made efforts to utilize this data effectively. This year, district staff members attend collaborative meetings at least once per month at each building to evaluate individual student data and determine best next steps. "It's a good reminder to other school districts that you have to be able to come together and collaborate on that data," Barreras-Brown said. Finally, every effort must be supported by the district's budget. Colton spends more per student, on average, than neighboring districts; and the ratio of adults to students is excellent, per the district's recent report card. According to Barreras-Brown, the district has also made further effort to ensure the schools' improvement plans, the district improvement plan and the district budget are all aligned.